Members of WEA's Transportation Committee may be on information after a recent meeting. 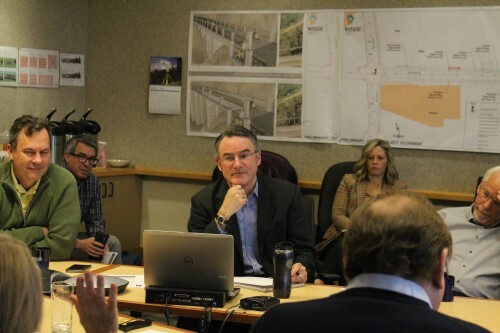 At their meeting this week, they heard from Metro's Kim Ellis about the Regional Transportation Plan (RTP); Multnomah County's Mike Pullen about the upcoming closure of Cornelius Pass; and Hillsboro's Dan Dias about a study of the Sunset Corridor. Ellis shared some of the policy targets surrounding the latest RTP, which include housing affordability, safety, and a reduction in green house gases or less vehicle miles traveled. The RTP considers possible funding from local, state, and federal sources over the next 25 years, and it prioritized 822 projects worth $15.4 billion based on that assessment. It also recognizes a need for an additional $13 billion for transit operations and maintenance, and $13 billion for highway, road, and bridge maintenance. Speaking of safety and maintenance, Pullen shared why Cornelius Pass will be closing for 13 weeks this summer - Cornelius Pass is a daily route for freight and commuters, despite its steep winding canyons. Highway 30 and NW Germantown Road starting in early July, and crews will work to soften some of the roadway's curves, replace culverts, and add guardrails, signage, and vehicle pullout space. Dias said in his presentation that Cornelius Pass was not built as a major transportation route. He and others would like to see a study of the Sunset Corridor. The Governor included $1 million in her budget for such a study, and Washington County and the City of Hillsboro have each committed $100,000 to it, with hopes the private sector will invest in it too. An earlier study, the Washington County Futures Study, recognized the need for more capacity and the use of technology in the Sunset Corridor. The Sunset Corridor Study would identify solutions and next steps. Dias said the study is expected to be done by 2021. To learn more about these issues, please turn to one of the following sources: Ellis' PowerPoint presentation, Dias' presentation, and/or the Cornelius Pass projectwebsite.